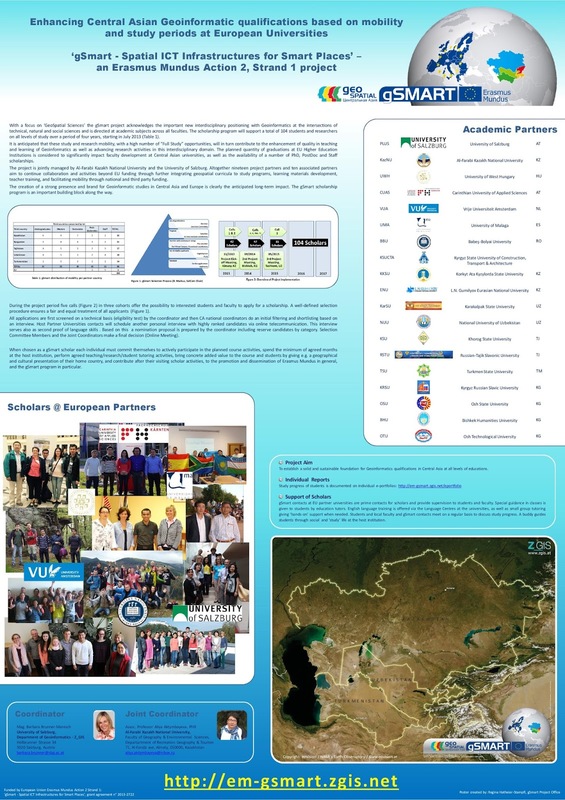 The gSmart partnership anchored on the European side as well as in the Central Asia region at partners having ten years of cooperation experience in developing education as well as research in methods and applications of geoinformatics across the spatial sciences. We are including additional partners and are reaching out to ‘target group 2 individuals’ to expand the geographical and thematic scope and to involve institutions not yet experienced with international mobility and cooperation programmes. Associate partners are assigned specific tasks with gSmart. Most are either industry actors or inter/national organisations and are expected to offer links and pathways into professional practice, e.g. by offering internships and placements to advanced students. In several cases, they will offer perspectives and role models by contributing case studies, demonstrations and application examples for the benefit and use of geospatial methodologies across a broad range of disciplines and application domains.